One featured attraction at the festival was not a musician, but rather a printing device: event sponsor Xerox was using its new Direct-to-Object Printer to produce customized souvenirs of the event for attendees - notebooks, water bottles, plastic wine glasses and golf balls could be personalized with a name or pithy saying. "People were actually taking movies of [the printer]," said Karl Dueland, Vice President and General Manager, Xerox. "Not only did they give the personalized objects as gifts, but then they showed the recipients the movie." The Direct-to-Object Printer is "The Document Company's" first foray beyond documents into the direct-to-object space, although the company has been offering customized direct-to-object printing solutions to individual customers for a number of years. The Direct-to-Object Printer, which launched last year, is an inkjet device that uses UV-cured ink (although it can also support other kinds of specialty inks, such as aqueous or solvent). It comes in CMYK plus white ink and can support up to 10 total channels, including special inks such as brand or specific PANTONE(r) colors, overcoats and primers. It can print three-dimensional objects, up to one cubic foot. The machine itself is designed to have a small footprint. The front end uses XMPie (a Xerox company) for personalization. It also features a large window so that onlookers can watch the item being printed - which, as Xerox found at the jazz festival, was a large part of the device's appeal. Unlike other printers, the Xerox machine moves the object past the printheads, rather than moving the heads over the object. The heads also jet ink a considerable distance for an inkjet printer - 7 to 8 millimeters - which gives the device the ability to print on curved items or on surfaces that have irregularities. It can print on a wide range of objects and materials, but non-porous surfaces lend themselves to better ink adhesion - plastic or glass, ceramics and objects like that. Some surfaces will require some kind of preparation - stainless steel might need to be buffed, glass may require a pretreatment and so forth. The goal is to broaden the range of items that can be personalized. "Personalization is driving sales in a number of areas, independent of age or demographics," said Dueland. "People want to make things their own. With this product, we allow them to do that." Initially, Xerox is targeting business- to-consumer environments. "There are a number of segments this is applicable for, such as a retail space, where you would have this on the shop floor," said Dueland. Another is at events or attractions. "People go to Niagara Falls and want to commemorate the experience. If you can personalize a souvenir - and do it immediately - then you've got a win- win." It also helps gift shops and other such retail locations minimize their inventory, as they don't have to carry a large stock of preprinted water bottles or other items with every popular name - or disappoint visitors who may not easily find their name. "Such as me looking for Karl with a 'K,'" said Dueland. Personalizing these items on-site solves both these problems. The goal is also to make it user-friendly for consumers. "In a retail environment, there would be a storefront where customers can pick their images and personalize them by putting their name or a saying on them," added Linda Krapf, Director of Business Development for Xerox. "At the jazz festival, we had images that people could pick from and the big decision was, 'what should I say?'" Although the direct-to-object printer is not intended for packaging or other industrial uses, there is no reason why the technology can't be extended to support those applications. Take, for example packaging prototyping. "If you have a particular shape or object and you want to look at a number of different designs, this device can kick out a prototype very quickly," said Dueland. "So you make it real in the designer's eyes." The direct-to-object printer technology came out of Xerox's Engineering Services Group, which fosters customer-led innovation. "They'll work with customers - maybe it's our iGen clients, who have a special need - and we can put a customized application on the end of that to integrate into their workflow or production line," said Krapf. "We learn more about their business and how it fits in." "Customer-led innovation is critical," added Dueland. "It's working with our partners and customers that keeps evolving what we can do and how we do it so it becomes of greater value to our customers and their customers." It is no secret that customization and personalization are driving more and more digital adoption among "industrial" printers and blurring the line between what is industrial and what is commercial. The Xerox device is obviously designed for commercial applications, but it's not hard to imagine it finding a space in more industrial uses, especially as the technology evolves. One rapidly growing area that, again, bridges the gap between industrial and commercial applications is promotional items, also known as ad specialties. Examples are custom-printed keychains, refrigerator magnets, pens and, today, smartphone cases and USB drives. A growing sub-segment of that market is promotional drinkware - wine glasses, pint glasses, water bottles, YETI cups and the like. "Promotional drinkware has always been a strong category for promotion," said Benjamin Adner, CEO of Inkcups, which recently launched a machine called the Helix to take on the short-run promotional drinkware market (see page 43). However, he added, "the ability to do multicolor graphics has been very limited. Today, everyone wants high-quality graphics." At the same time, users want to access a web-to-print portal, upload a photo of, say, their dog and have it printed on their drinkware or other item as a gift. Until recently, to print high-quality multicolor graphics on items like drinkware, you would need to use screen printing. "You can get some pretty high- quality images but you have to be set up for long runs," said Adner. "If you just need to produce 250 three-color pieces, it's impractical to set up a screen press. That's why the Helix was developed." Designed by Inkcups and manufactured in the US, the Helix prints CMYK plus white and varnish and it can match a wide range of PANTONE and brand colors. It uses LED UV-cured inks and can thus print on a wide variety of surfaces, such as stainless steel, plastics and glass. To promote ink adhesion, these surfaces occasionally need to undergo a process called flame treatment. As a complement to the Helix, Inkcups offers the AutoFlame 360, an automated f laming system that allows users to flame an entire day's production run offline in, the company says, about half an hour. Inkcups was founded by Adner in 2001 and offers a full range of digital and analog inkjet and pad printing equipment for a variety of industrial printing applications, including the XJET800, an all-new high- volume industrial inkjet printer and the XJET series of flatbed-style inkjet printers. But it's the Helix that is taking Inkcups beyond industrial printing and into more commercial markets. "We're finding a lot more customers in different marketplaces are interested in digital printing on cylinders," said Adner. "Colleges, professional sports, TV shows, Disney and all licensed product markets require high-quality multicolor graphics." "The glassware and barware market is very strong," added Gregory Harwood, Inkjet Manager for Inkcups. "We're printing multicolor on wine glasses, pint glasses, beer bottles and wine bottles. There are also a number of retail companies: Camelback, Swell and YETI are all household names now." Indeed, the copper-lined stainless steel drinkware that can keep beverages cold or hot for days at a time, sort of the next- generation Thermos, has been particularly hot - and is appropriately, staying hot. YETI is the big name in this area, but there are a number of brands in the market. As direct-to-container printing scales up, it will have obvious advantages over what has been a traditionally strong market: label printing. One of the fastest-growing parts of the graphic arts has in fact been digital, short-run label printing. Although few foresee the elimination of labels any time soon, direct-to technologies are likely to give labels a run for their money. An interesting technology recently launched by Yupo may be the "missing link" between direct-to-container printing and labeling. Yupo Sculpt is a package decoration technology designed for in- mold labeling of blowmolded packaging. Say you have a plastic bottle of laundry detergent. The name of the company can be embossed in the plastic and, using Sculpt, an in-mold label can be applied directly to just the embossed text, ensuring that the label lines up with the embossed image. Still, the Holy Grail for many is printing directly on containers. "What we're promoting in our inkjet system is what we call 'liquid labels,'" said Timothy Scully, VP of Sales for Engineered Printing Solutions. "The whole idea of liquid labels is that no longer are you printing on a piece of paper and then applying it to a product. You're printing directly on the product." Based in East Dorset, Vermont, Engineered Printing Solutions was founded in 1985 and specialized in - and continues to provide - pad printing solutions for a wide variety of vertical markets. The company was recently acquired by Xaar, of which Engineered Printing Solutions now operates as a wholly-owned subsidiary. "The acquisition has given us the ability to concentrate on developing new products," said Scully. The company has moved into the digital inkjet world and offers several lines of flatbed machines. 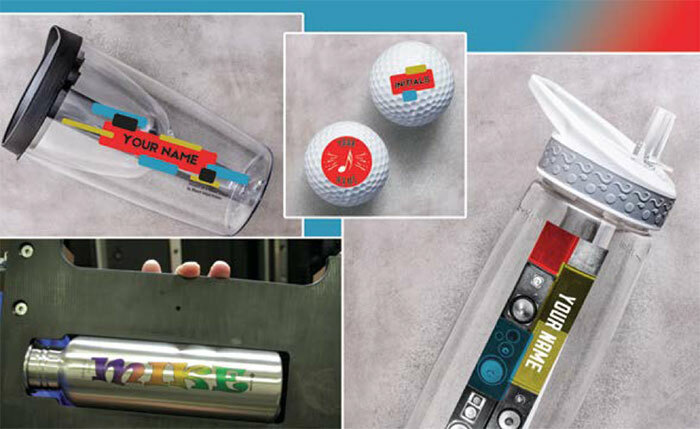 For direct-to-container printing, Engineered Printing Solutions began with its BottleJet series - a high- quality UV inkjet system that can print directly on bottles, with a version that can also print on cups. (Cups very often differ from bottles in that, when they taper, the system has to compensate for the changing diameter along the height of the cup.) The BottleJet can produce about a single bottle or cup per minute. The company's latest product is the much faster RotoJet, which is designed for higher-productivity printing of cylindrical objects such as bottles and cups. The RotoJet is a completely new product for Engineered Printing Solutions, with development first beginning back in January. The RotoJet is making the rounds of this fall's trade shows, from PACK EXPO to the SGIA Expo. The RotoJet was developed to take advantage of the gap in the inkjet direct- to-container printing market between the really high-production machines - the Tills, Dubuits and Kammanns of the world - and the lower-productivity BottleJet. "You've got machines that can produce over 60 a minute and others that print one a minute, but nothing in between," said Scully. "Our focus was to develop a machine that would fit that middle market, that could produce 700 or 800 pieces per hour compared to 60 per hour and to build it at a cost that is affordable and gives the customer flexibility on what they can print." 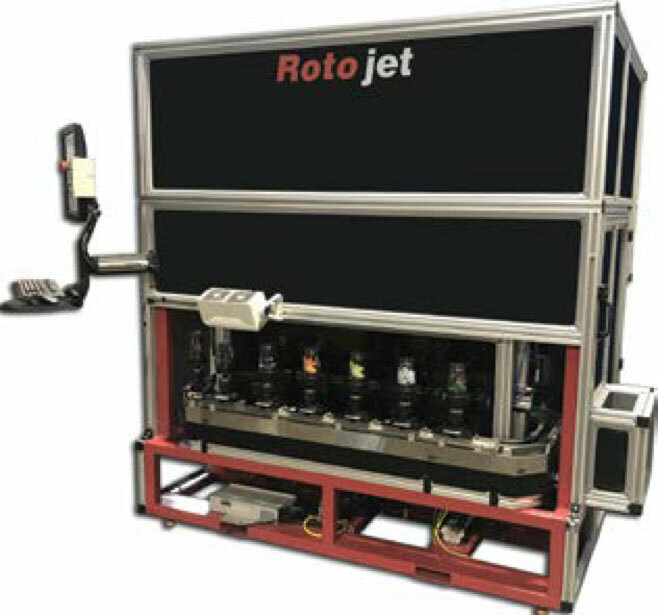 The RotoJet is a high-resolution, multicolor, LED UV printer designed specifically for decorating cylindrical objects, capable of handling both f lat- walled and tapered cups and bottles. (The variable diameters of tapered objects is compensated for in software.) It offers a synchronized printing and curing operation, with CMYK plus white inks as well as optional primer and varnish heads available. The print speed averages 800 pieces per hour, although throughput will vary by image size and object diameter. Printing on bottles and other cylindrical objects is not necessarily difficult. The problems begin when a) you want to print on objects that are not perfectly cylindrical and b) you want to print on cylindrical objects that differ in size. "The challenges of digital printing on bottles, particularly if they're not perfectly round, is that the tooling has to be very precise," said Julian Joffe, President of Engineered Printing Solutions. "This is because you get variations in the distance between the surface and the printhead and you'll have issues with relative registration. The flight time of your droplets as they travel through space will vary, so if the bottles vary in position - if they're slightly off-round - you're going to get a horrible print." The "tooling" - also called a "fixture" - holds the bottle in position as it moves past the printheads. One of the traditional challenges of inkjet bottle printing has been the need to change the tooling to accommodate different bottle sizes and shapes. In the rotary bottle printing industry, the first inkjet systems that came out were high-speed, but very complicated, very expensive machines that didn't allow the tooling to be changed easily. "If you want to go from Product A to Product B, you need to invest heavily in tooling," said Joffe. "In inkjet, you need very fast changeover, which is feasible if you're printing on the same product. If different bottles have different diameters or fittings, you're suddenly faced with not only a changeover time that is lengthy, but it's also very expensive." Enter the RotoJet. "We wanted to produce a machine that required less tooling and was easier to tool, to allow customers to go from Product A to Product B or Product C and still maintain the quick changeover a digital machine offers," said Joffe. Rectangular bottles - think of, say, a Jack Daniels whiskey bottle - present other issues that can affect both speed and image quality. "If you have rectangular bottles and you run them through very fast, the gap between the bottles causes an airfoil effect," said Joffe. "Little waves of wind traveling between each bottle create turbulence inside the print engine, which causes issues with image quality." Engineered Printing Systems' customer base is in virtually every industry, with some of the largest verticals being ad specialties, medical, automotive and even the safety industry, such as manufacturers of hard hats and first aid kits. "All of those have gone from analog systems and are now moving to digital," said Scully. "Digital is where the market is going to go and where our industry is going to go, no question about it," said Joffe. We are still at the very beginning of the digital direct-to-container and direct-to- object evolution, one that is being driven by the usual suspects of personalization, customization and shorter-run printing. As soon as you get the order, you need to print it. "We are moving to an on-demand industry" said Fabien Philipperon, Export Sales Manager for Machine Dubuit. Based in Paris, Machines Dubuit started manufacturing screen printing equipment for object decoration and, like other companies, has moved into digital inkjet, launching a direct-to-object inkjet machine 15 years ago. "We have two ranges of automatic machines," said Philipperon, "high-speed and small run production." The Model 9150 is an LED UV machine that prints on cylindrical and flat objects at a speed of about 800 pieces per hour. The company's latest entry is the Model 9450. Machines Dubuit's sister company, Encres Dubuit, manufactures the inks. Dubuit's top verticals are promotional and cosmetic products. As the market changes, so, too, must equipment manufacturers keep up. "We have to make specific machine conf igurations to answer market expectations," said Philipperon. As direct-to-container/object printing continues to evolve, it may also change the definition of what constitutes industrial printing and how it differs from commercial printing. Richard Romano has been writing about the graphic communications industry for almost 20 years, and covering wide- format printing since 1998. He is a senior analyst for the news and information portal WhatTheyThink.com, covering wide-format, production inkjet and environmental sustainability. He is the author or co-author of more than half a dozen books, including The Third Wave.